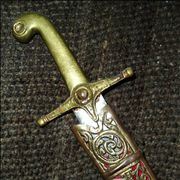 First swords appeared in the Bronze Age as an evolution from a dagger. Earliest date from the late 3rd millennium BC, were found in the Middle East and were made from arsenic copper, then in tin-bronze. Swords that had blades longer than 60 cm were rare at the time and first usable blades appeared in the late Bronze Age because bronze used before that was too soft to make a long blade that would not bend while used. Only with stronger alloys such as steel and improved heat treatment processes longer swords became practical. Earlier swords also had blades intended for thrusting while later swords were designed as both cutting and thrusting weapons. Bronze swords appeared in China during the Shang period between 18th and 12th century BC. In South Asia earliest available Bronze age swords of copper date back to 2300 BC. 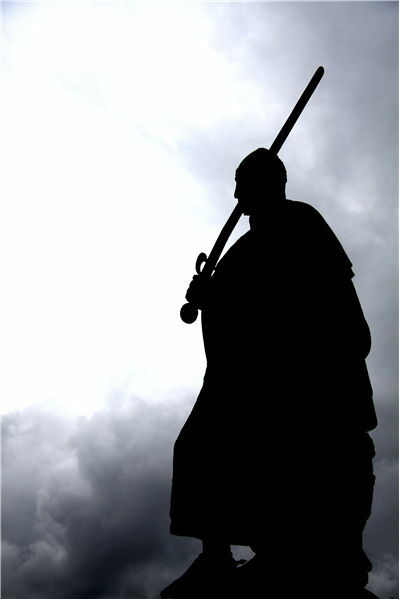 History of swords is long as the written history of human kind. In that time technology and materials changed, they changed in design trying to follow demands in the human warfare and some skillful swordsmen wielded them. When we found out that knifes and daggers were too short and that we don’t want to step closer to the enemy because that would not be too healthy, we started making swords. 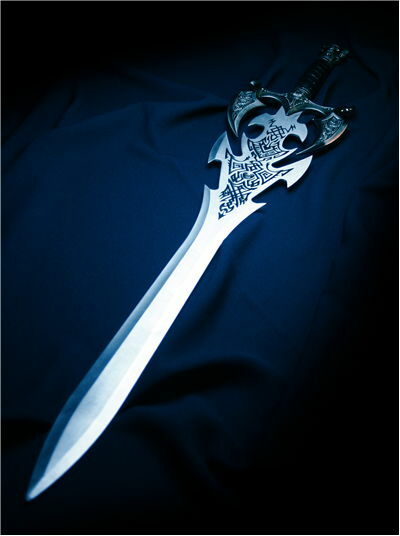 Here you can read more interesting facts about swords. 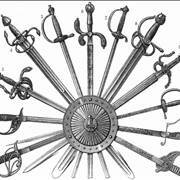 First iron swords appeared in the 13th century BC and were work-hardened like bronze swords by hammering. They were only slightly better than bronze ones but were more commonly available because they were more easily produced and had more available raw materials for construction. 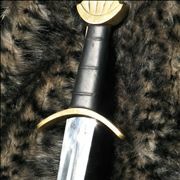 The Greek xiphos and the Roman gladius are typical examples of the Iron Age swords. They were 60 to 70 cm in length. Ancient Romans also made spatha which was longer (0.75 and 1 m) and gave infantry more reach when thrusting. 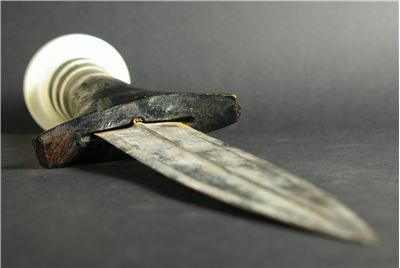 Persians used a sword called akinaka in the first millennium BC which they “borrowed” from the Scythian design and made it popular after the great Persian conquests. 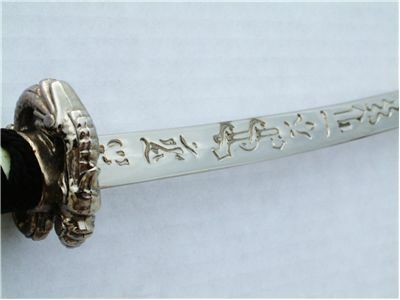 Chinese steel swords became widely used in the 3rd century BC. 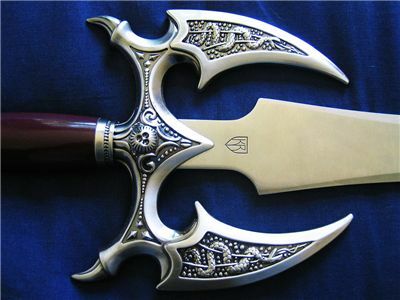 Middle Ages hade much more advanced technology and swordsmiths started making swords of higher quality. Spatha type remained until then as a design but 10th century sees properly quenched hardened and tempered steel which became predominant material in making swords. One of the swords of a higher quality was The Frankish 'Ulfberht' blade and because of that Charles the Bald tried to prohibit the export of these swords because Vikings were using them in raids against the Franks. 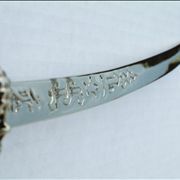 Indian subcontinent became producing Wootz steel (or Damascus steel) which is also considered for a steel of a higher quality. 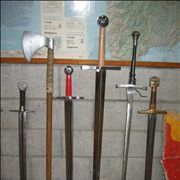 The first crossguards appeared in 11th century on Norman swords. Swords were mainly done for cutting but at that time appeared first mails and plate armors which shifted design toward thrusting swords. 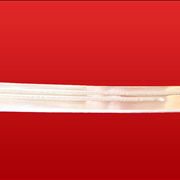 Precursor to the katana, so called tachi, appeared in 900AD in Japan with improvement of steel technology. From around 1300 to 1500 armor improve so swords change design also. Grip elongates to allow both hands to hold the sword and deliver stronger blow. 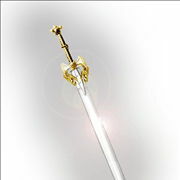 Estoc type of swords also appears. They are longer, two handed swords but without edges and with sharp point that could wedge between the parts of the armor. In time, with appearance of the gunpowder, swords fell out of favor as a weapon of war. Today they are used for ceremonial purposes, as part of ceremonial uniforms and in sports like modern fencing. The fuller (rounded or beveled groove or slot in the flat side of a blade) is not made to release pressure in the wound so the sword doesn’t stick but it is made to lighten the blade and increase its strength and stiffness. The best swords of the Middle Ages (and later) were made in the lower Rhine in Germany and in Toledo, Spain. Hittites were the first to heat iron in carbon, hammered it into shape and quenched it in water. With that they developed an early variant of steel.